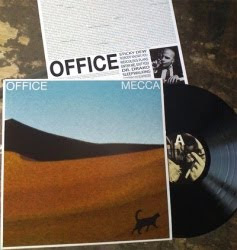 Back in January, Scott Masson of one-time Chicago alt-pop act Office released the group's latest record, Mecca, for free download. The files are still up for grabs, but starting today you can also pick up a copy on vinyl through Quack Media. The Office lineup that recorded Mecca is no longer in tact - Masson moved back to his home state of Michigan late last year after getting mugged and robbed before a recording session in Chicago - but Office remains an active project featuring Masson and various players. The LP costs $14.99 and is available here.